NORTH EAST, Md. – It was a sunny Thursday afternoon, and the sounds drifting out of the music studio in Elkton Station were a sweet combination of jazz and blues. Providing the beat for this performance was Ben Goldman, who teaches percussion instruments for Cecil College. Goldman has been playing professionally with jazz quartets and quintets throughout the region and is in his fourth year of teaching in the Cecil College music program. Most recently, he released his first full-length album for where he was the band leader. The self-titled album Glen Boldman & The Philadelphia 5 features original pieces composed by Goldman and fine-tuned with his bandmates. The Philadelphia 5 is comprises of Sam Nobles on bass, Kevin Cross on guitar, Blayne Salerni on trumpet, Andrew Bedell on tenor saxophone, and Ian Kurlan on vibraphone. “In the beginning, I just wanted to get the music out there for my consumption. But then I put it on Bandcamp and got a lot of positive feedback. People approached me about putting it out there for the greater public for distribution,” said Goldman, as the creative spark was lit. Glen Boldman & The Philadelphia 5 features four original tracks with each piece representing a period or mood from the previous five years of Goldman’s life. Composing these tracks was an emotional and cathartic process for him, especially so for the song December 2017when a major life event occurred, and Hip Dip, which is about meeting his girlfriend. “I took all the compositions I had and tried to work them out in long form as compositions. I don’t compose for this kind of music frequently, so it was a cool experience and process for me to work through,” said Goldman, who earned a bachelor’s degree from the California Institute of the Arts before completing his Master of Fine Arts in music performance from the University of Delaware. “When I am writing, I will start something and then not touch it for a couple of months or years, and then rework it. There has been a constant editing process, so I don’t think any of them is a perfect composition. I have a lot of room for growth,” he added. The second track on the album is called Klezmericaand is inspired by Eastern European Jewish music, which evolved considerably as Jewish immigrants from Eastern Europe came to the United States and discovered American jazz. Since its revival in the 1970s, klezmer is known mainly in the American form. The third track is The Slizzard, inspired by Northern Indian classical music based around a 33 beat cycle. Although Goldman is only 27 years old, he has been playing percussion instruments for more than 20 years. 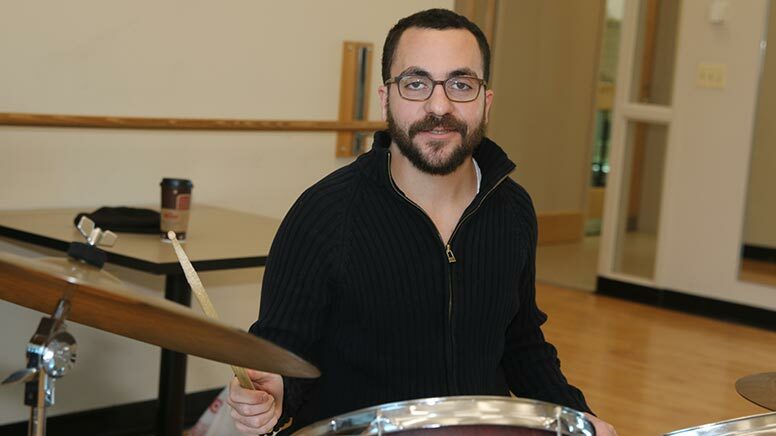 A native of Trumbull, Connecticut, Goldman trained under the influence of percussionist great, Jim Royle, former president of the state chapter of the Percussive Arts Society, for sixteen years. Royle specializes in world percussion instruments with a focus on global music made as a universal language. Having these different musical experiences outside of the classroom has helped him to synthesize the knowledge so his students can meet professional expectations on their instrument of choice. When not in the classroom, Goldman is performing with his quartet and quintet, as well as with 6-Wire, a University of Delaware ensemble in residence. He regularly tours with the Rodney Marsalis Philadelphia Big Brass, a New Orleans style jazz band. “As a music major, a lot of what we talked about was pedagogy and andragogy, making sure you are teaching to your audience and then the method behind that as well. I feel having years of experience teaching students from all different backgrounds helps me cater to what each student wants to get out of their lessons here at the college,” said Goldman. His experience in the classroom has made him a better performer as he must do the same exercises as his students but to a higher level of excellence. You can catch a live performance by Glen Boldman & The Philadelphia 5, on Thursday, Feb. 7, at The Pharmacy (located at 1300 S. 18thStreet, Philadelphia). This show is open to all ages and begins at 8 p.m. Glen Boldman & The Philadelphia 5 can also be heard on Spotify.